Speakers from various medical specialties elaborated on topics pertaining to the fundamental science, diagnostic approaches and treatment of osteoporosis. Osteoporosis is a major problem due to its extremely high prevalence among the general population, its dangerous complications and the high cost of treatment. 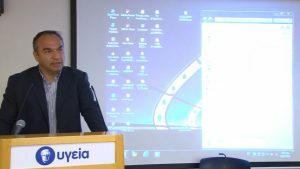 Upon concluding, Professor G. Lyritis mentioned that the highly trained physicians from all medical specialties currently working with HYGEIA Hospital have excellent communication among them and constantly exchange scientific opinions, which contributes to assisting and treating patients with osteoporosis and other conditions. Apart from HYGEIA Group physicians, the meeting was also attended by postgraduate scholarship holders, nurses, university students and many people suffering from osteoporosis.